Compare Pricing Online Printing - Find the cheapest online printing! 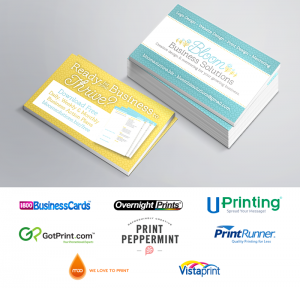 100 full color, double sided cards were ordered from each print company. The least expensive processing and shipping options were selected. The lowest price glossy stock available was ordered. The files were each professionally designed with Adobe Illustrator CS6 using the individual print company’s own start file so that it was set up to their exact specifications. Some companies offered built-in discounts. A few had easy to find coupon codes. I applied them where possible. 14pt glossy, UV coating both sides. 15pt glossy, UV coating both sides. 16pt, high gloss UV coating both sides. That’s a total of $217.43 for 800 cards. Oy vey. A small tax deductible sacrifice in the name of research, right?! There are a few affiliate links on this page to help defray my costs. Both of these were so straightforward. Upload your files, approve digital proof, select options, pay. Done! Both of these seemed like the system was created for designing the card online, not for uploading pre-made files. It was unnecessarily confusing. Coming up in Part Two I’ll compare print quality & speed of delivery. I expect to have all the cards delivered by September 7th.